« “These guys could have gotten killed”. Survivor Steve Barry, on American soldiers in combat who stopped to liberate him and 2500 others. HUDSON FALLS — Holocaust survivors freed from a Nazi death train by American troops are getting together with two of their liberators in upstate New York. The five survivors were children or young adults when they and about 2,500 other concentration camp inmates were liberated by members of the Army’s 30th Division in April 1945, just weeks before the end of World War II. 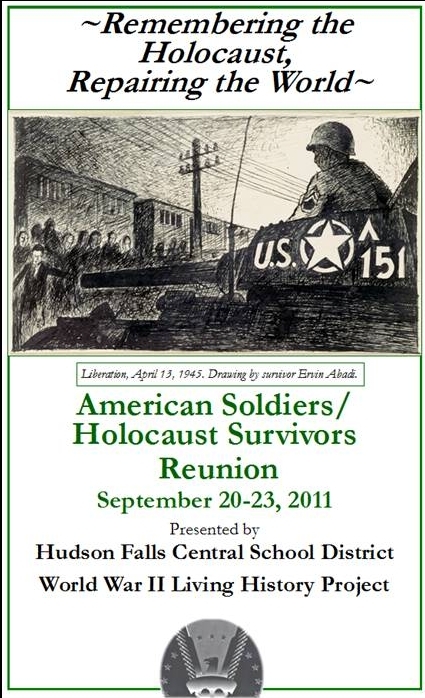 Four years ago this month, the first reunion of train survivors and the soldiers who freed them was held at Hudson Falls High School. That’s where history teacher Matthew Rozell’s World War II project helped the veterans and Holocaust survivors reconnect. A welcoming dinner is being held Tuesday night at a resort near Lake George. The last of Rozell’s educational reunions is being held Wednesday through Friday at the high school. 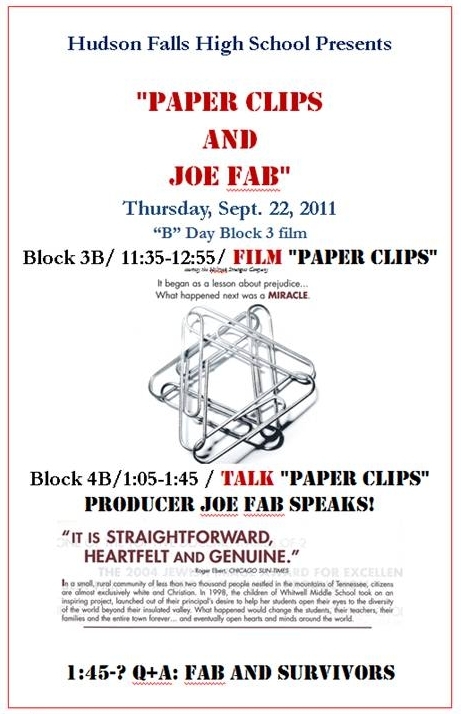 Mr. Fab has received wide acclaim for his work as producer, writer and co-director of the feature documentary “Paper Clips”.“Paper Clips” has been praised by critics and received numerous film festival awards, both from juries and audiences. It was named one of the top five documentaries of 2004 by the National Board of Review and received the Jewish Image Award in recognition of its promotion of cross cultural communication. 2pm: Survivor discussion to follow with q+a with students. Speaker: Robert Miller, author, Hidden Hell and Portraits of Service Upon returning home, too many veterans were met with indifference and did not receive continuing support, struggling to rebuild shattered lives to restore a sense of normalcy. Mr. Miller will discuss his fathers’ POW experience and his upcoming portrait book which focuses public attention on the living veterans of all wars who have experienced the horrors of war on behalf of our nation. Micha Tomkiewicz was born on May 25, 1939 in Warsaw Poland- three months before the German invasion that started WWII. The family lived together in the Warsaw Ghetto. Toward the end of 1942, he was moved to the Christian side of the city. After the Ghetto uprising and the destruction of the Ghetto, most of his family was transported to the Treblinka concentration camp. His father and two uncles jumped from the train; his father and uncle were shot and killed by the Germans, but one uncle survived and walked back to Warsaw. In June, 1943, Micha, his mother and the surviving uncle were transported to the Bergen Belsen concentration camp as part of a hostage program that was designed by the Germans. On April 13, 1945, the train transporting the hostages was intercepted near Magdeburg, Germany by a unit of the American 30th Division. Micha and his mother were transported to the Hillersleben Displaced Persons camp. After liberation, Micha was educated in Palestine, which in 1948 became the State of Israel. He is now Professor of Physics and Director of the Environmental Studies program at Brooklyn College of the City University of New York. In 2004 Helen began drawing from the inspiration of her surroundings to reach out in a personal way for a more empathetic and compassionate world. She created The Patton Stiftung Sustainable Trust as a natural progression of the enduring peace which her grandfather George S. Patton Jr. helped restore to Europe in 1945. The Trust’s goal is to nurture constructive, sustainable culture in which difficulties can be worked out and dissonance celebrated.